Most pet owners agree: The minute you adopt a new cat or dog, he or she becomes an important part of your family. In fact, pet parents are often just as adoring and devoted as new moms and dads (and they often post just as many pictures of their “children” on Facebook and Instagram, too). That’s why, when it comes time to search for an apartment, pet parents want to find a place that suits their furry friends as much as it suits them. Many people think that large dog breeds, like greyhounds, mastiffs or German shepherds, will feel cooped up and unhappy in small apartments—and it’s easy to see why people believe this particular myth. But in reality, large dogs can be perfectly happy in an apartment! The size of your apartment isn’t as important as the amount of exercise your dog gets on a daily basis. Some higher-energy large dog breeds need more exercise than others, but as long as the dog’s needs are met, apartment living is no problem. However, it’s important to keep in mind that some property managers and landlords have weight and breed restrictions, which means you may run into a few obstacles before finding the perfect place to live. The truth is, unless the apartment listing explicitly states pets aren’t allowed under any circumstances, it’s often possible to negotiate with landlords about their pet policies. In general, independent landlords are easier to negotiate lease terms with than condominium associations and property managers, but keep an open mind and don’t be afraid to ask during your apartment search. Also, make sure you’re prepared to “sell” your pet when you start apartment hunting. Make up a pet resume that includes its name, breed and weight, a photo and any medical information, including records of spaying or neutering and up-to-date shots. Landlords will likely require some of this information anyway, and they’ll be much more likely to negotiate if you can prove your pet is as sweet and well-behaved as you say he is. Landlords can certainly charge pet rent and deposits on top of regular rent. The only instances in which this isn’t OK are when the pet is a registered service animal (in which case the tenant would have to provide proof) and if the unit is under rent control. Some states have pet deposit maximums, so check your local laws for more details. Remember that it’s common for landlords to charge more for dogs than for cats, and that some dogs might cost more than others as well, depending on their size or weight. 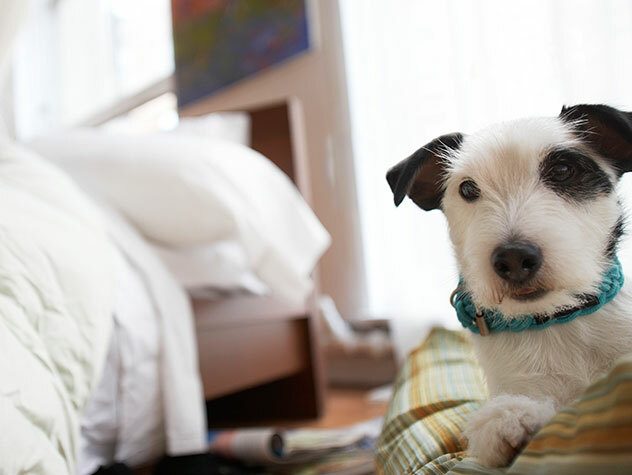 Many renters with pets pay a pet deposit assuming they’ll get it back with no problems, but some deposits are actually nonrefundable fees that landlords use to deep clean the unit after you move out—even if your pet caused no damage. Make sure to read the pet policy on your lease thoroughly so you know the difference. There are several common misconceptions surrounding spaying and neutering pets. Some people think spaying or neutering their dogs and cats will cause problems, while others believe it’s not necessary if you only have one pet. But spaying and neutering is widely recommended no matter what, and is even sometimes required by landlords. That’s because unaltered dogs are more likely to show aggression, bark excessively and mark with urine (even while they’re inside) than spayed or neutered puppies. Unaltered cats are much more likely to spray urine and roam than those that are spayed or neutered at an early age. Plus, spaying and neutering can help prevent some serious health issues later in life, including some types of cancer. Some cat parents declaw their cats to keep them from scratching up hardwood floors, walls and furniture. Unfortunately, though, declawing causes a lot of pain and creates problems in most cats that undergo the procedure. Declawing involves not just removing the claws, but actually cutting off the first “knuckle” of each toe. Since cats walk on their toes, this can cause pain for their entire life—and they often deal with that pain by excessively biting or avoiding the litter​ box. Niccole Schreck is a rental experience expert for Rent.com, a free rental site that helps you find an affordable pet-friendly apartment and provides tips on how to move with your pet. She is also the proud owner of two dogs, Bella and Wallace.